and more enjoyable shopping experience. Eatnuts is a more advanced website than nuttex.com. Products are easier to find, with more helpful information on each page. The site also allows us to more easily feature products and promotions that we think you will enjoy. We strive to be a more customer friendly website. Create an account and the website immediately provides you with an improved shopping experience. Manage your account details, track your purchase history and get special pricing on products—all in a proven online shopping format that should be familiar to you. New products – Famous mixes and roasted/seasoned items, created in-house. A product of the month each month! New offers – 1lb. options for all of our products! Enjoy more of our products on each order! 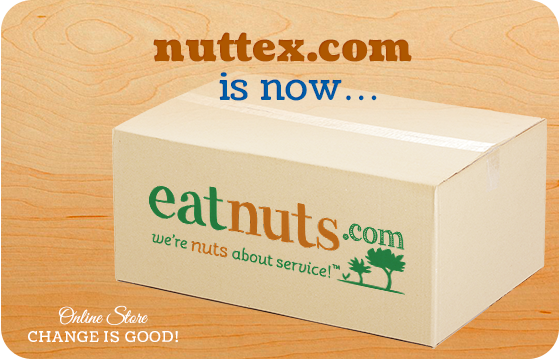 We're the same great company with the same quality of products as nuttex.com… we're nuts about service!